« The dreaded interruption – give me some mental elbow room. The first task is for each of the team members to draw a picture or write a word that describes how they feel about the sprint. This could be anything from a smiley face to a figure being chased through a maze by a demon. The drawings should only take a few minutes. Each team member then sticks their picture up on a wall and talks a little about what it means. 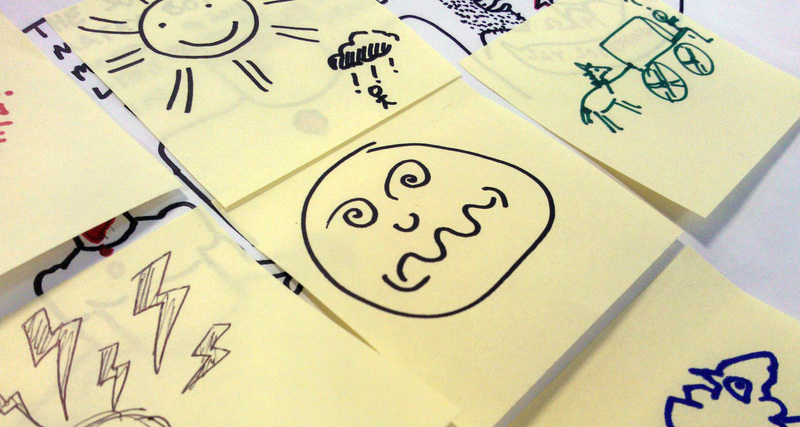 The drawings along with their explanations both allow team members to express how they are feeling and can provide a valuable litmus test of team moral. The second task is for each team member to write three things ‘good’ and three things ‘bad’ about the sprint. You may wish to substitute ‘needs improvement’ for ‘bad’ depending on the culture of the team and organisation. Each team member then presents their observations by sticking the post-it notes to the wall with a little explanation about each one. Points of a common theme should be grouped together. Once all team members have presented and all points have been grouped the team then votes for the points that they would like to discuss. Each team member has three votes and can use them however they wish. For example a team member could distribute their votes between three issues or use all three votes for one that they strongly feel requires discussion. Voting is done by simply ‘ticking’ the relevant post-it. The voting system could be modified depending on the organisation. Some people prefer a flat hierarchy and democracy is nice but some teams may prefer to give more weight to its more senior members or even provide a veto. Be very careful with this as it can do more harm than good. After voting is completed and the points with the most votes are then explored by the team with a view to solving issues and ensuring ‘good’ practices are carried forward. The format for the interrogation of issues raised should also be structured. Once the team has clearly defined an issue then each team member should grab a post-it note and without speaking or campaigning proposes a solution. The solutions are then stuck to the wall where the team can first discuss and then vote on them. The winning solution should be incorporated into the next sprint. A Retrospective meeting brings a positive sense of closure to the sprint. It provides time for reflection and a forum for people to express their concerns. Retrospective is at the heart of the Agile process it fosters good team communication, encourages Continuous Improvement, asks people to Inspect and Adapt and requires the team to have a ‘fix it when it breaks mentality. Can’t beat a good retrospective… I’ve not seen the post-it drawings before though, and the voting process makes for a good way of ensuring any pain-points get acted upon.